Simchat Torah is a celebratory Jewish holiday that marks the completion of the annual Torah reading cycle. Simchat Torah literally means "Rejoicing in the Law" in Hebrew. Throughout the year, a set portion of the Torah is read each week. On Simchat Torah that cycle is finished when the last verses of Deuteronomy are read. The first few verses of Genesis are read immediately afterward, thereby starting the cycle again. 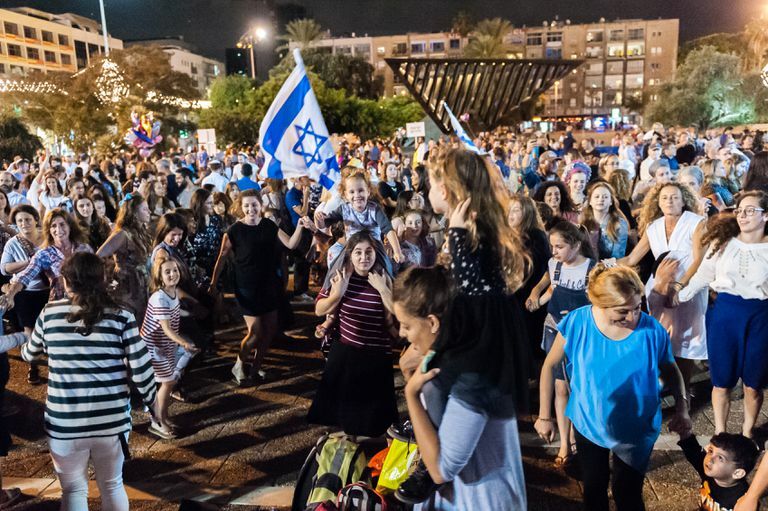 For this reason, Simchat Torah is a joyous holiday celebrating the completion of the study of God's word and looking forward to hearing those words again during the coming year. In Israel, Simchat Torah is celebrated on the 22nd day of the Hebrew month of Tishrei, directly after Sukkot. Outside of Israel, it is celebrated on the 23rd day of Tishrei. The differences in date are due to the fact that many holidays celebrated outside the land of Israel have an additional day added to them because in ancient times the rabbis worried that without this extra day Jews might become confused about the date and accidentally end their holiday observances early. In the Jewish tradition, holidays begin at sundown the day before the holiday. For example, if a holiday were on October 22, it would actually commence on the evening of October 21. Simchat Torah services begin in the evening as well, which is the start of the holiday. The Torah scrolls are removed from the ark and given to members of the congregation to hold, then they march around the synagogue and everyone kisses the Torah scrolls as they pass. This ceremony is known as hakafot, which means "to march around" in Hebrew. Once the Torah holders return to the ark everyone forms a circle around them and dances with them. There are seven hakafot in total, so as soon as the first dance is completed the scrolls are handed to other members of the congregation and the ritual begins anew. In some synagogues, it is also popular for children to hand out candy to everyone. During Simchat Torah services the next morning, many congregations will divide into smaller prayer groups, each of which will use one of the synagogue's Torah scrolls. Dividing the service up this way gives every person in attendance the opportunity to bless the Torah. In some traditional communities, only the men or pre-bar mitzvah boys accompanied by adults bless the Torah (post bar mitzvah aged boys are counted among the men). In other communities, women and girls are also allowed to take part. Because Simchat Torah is such a happy day, services are not as formal as at other times. Some congregations will drink liquor during the service; others will make a game out of singing so loud that they drown out the cantor's voice. Overall the holiday is a unique and joyful experience.